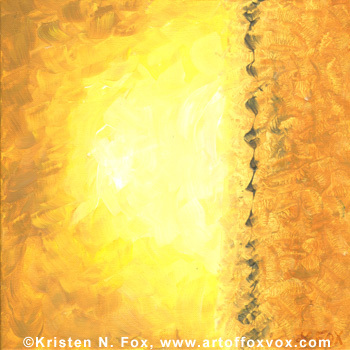 I think I painted this in the winter, when I might have been feeling a need to see warm, golden sunshine emerging into the world, even if the origins are a bit muddled. The limited pallette (just golds, white, and grays) keeps all the golden ‘feels’ without distraction. 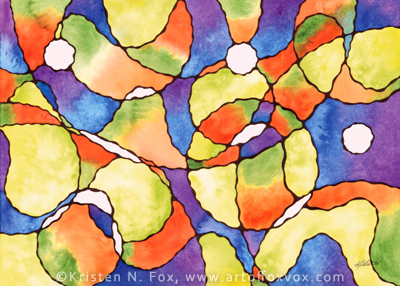 Carnival balloons is a great experiment in outlining, as well as watercolor paint gradations, and, of course, circles! I love the colors in this (most of the spectrum, minus red for some reason), and it makes me think of the wonder of a first visit to a carnival, with balloons, and ridiculous games, and silly stuffed animals to win, and rides! Click on the image above to see a zoom image and for fine art print options! Abstract Weirdness – Art and Prints | Powered by Mantra & WordPress.